The problem of value fluctuations and slow payment processing speed is a disadvantage of conventional cryptocurrency. To resolve this, Qcity creates a separate trading instrument called a Qcoin. 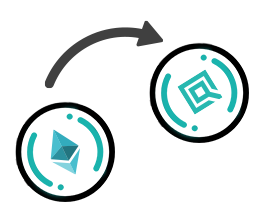 Q-Coin is used within the Q-platform and maintains a 1: 1 value with the legal currency. It is a business platform designed to be used in the real world of cryptography. deduction fund according to the autonomous protocol. increase the next level of difficulty. It is three times the reference block time. lowered to prevent a block paralysis. Come and try the great experience of Qcity wallet! Overall leader of this project, over the past 18 years hold experiences in project planning and management, and developing blockchain related Workflow system, instant billing system, loan system, pay system, point systems etc. As a full-stack developer with more than 20 years of experience, He has led various financial related projects, has also developed security and various special programs, and leads key development teams related to blockchain. A developer with 15 years of experience, specializing in pay system. In charge of developing blockchain related infrastructure systems such as Q-pay, Q-s2s, Q-point, etc. A developer with 15 years of experience, specializing in pay system. In charge of developing blockchain related infrastructure systems such as Instant loans, shop-to-shop loans, Q-crm, etc. A developer for seven years, and is responsible for front-end development. A developer with 15 years of experience, specializing in security-portal and system integration. responsible for back-end development. 10여년간 국회에 근무한 경력이 있으며, 기획 및 컴플라이언스를 책임지고 있다. 현재 건축사이며, 건축자재플랫폼 사이트를 경영하고 있고 블록체인이 향후 비즈니스와 사회 전반에 끼칠 영향에 대해 고민하고 있으며, “탈중앙화”와 “분산화된 중앙화”의 개념으로 본 프로젝트가 한쪽으로 치우치지 않도록 중심을 잡아주고 있다. 현재 영국에 거주하고 있으며, 10년 경력의 Financial analyst로써 IMC, CAIA 자격을 보유하고 있고, 국제적인 시각에서 금융과 본 프로젝트의 방향을 조언하고 있다. 현재 로봇개발 회사를 경영하고 있으며, 차후 블록체인 기반의 로봇 로그기록과, 임대형 로봇에 대한 Qcoin의 결제 방법 등에 대해 연구하고 있다. 현재 안과 의사이고, 물리학 전공자이기도 하다. 평소 프로그램 및 IT관련 분야에 많은 관심을 가지고 있어 본 프로젝트와 관련하여 중소 병원과 Qcoin과의 연계성에 대해 연구 및 조언을 하고 있다. 현재 세무사이며, 블록체인 기반의 비즈니스에서 암호화폐와 관련한 회계업무에 관심이 있다. 본 프로젝트의 세무와 관련한 조언을 하고 있다. How certain is the ICO schedule? When is the date of listed exchange? It will be listed within three months after the end of the ICO. Did the coin development completed? Qcity has been developed and completed, the core, Explorer, Mobile Wallet, have been developed completely in all mining pool. What is the total issue volume and the line mining volume? With a total issue volume of 500 million units, the company will have mined about 390 million to build a business platform for small and medium-sized businesses and the remaining 110 million will be mined through mining. What is the difference between Qcity and others? In November 2017, Qcity completed the development of mainnets and related services, and completed the review of the block and network stability through one year of mainnet operation. In addition, we have applied a hybrid agreement algorithm called 'SOW' (PoS + PoO + PoW), which is strong in security, to Qcity along with patent registration. When does the platform completed? The Q-platform development will begin after the end of ICO, Q-pay (instant payment) system will be completed in the first half of 2019, Qshop2shop and Q point development will begin in the second half of the year. Is there a company affiliated to the Q-platform implementation? With the signing of a business agreement with the Federation of Korean Businessmen’s Organizations and providing basic handsets to small business owners and use them without appending additional devices. What is the difference with the existing pay system or the payment platform? 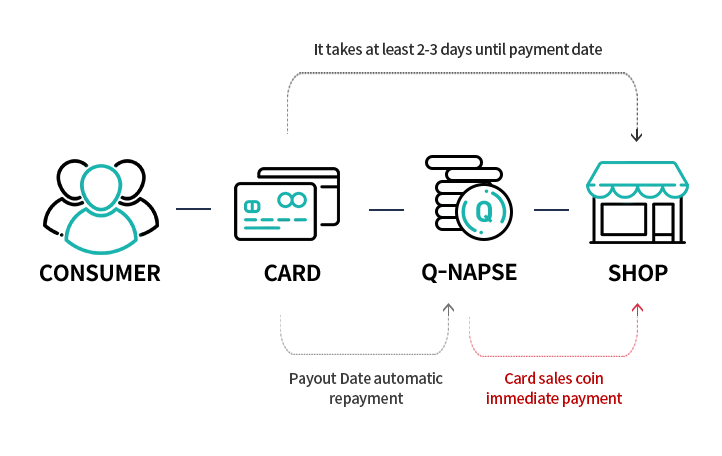 A system to help fund the rotation of the small and medium-size business to the commercial distribution via the Q-pay (immediate payment) and Q-s2s (Q-shop) by converting card sales into cryptocurrency for immediate distribution. Can card payments be actually possible on based revenue immediately? The market of instant loans are formed but has not been enabled by circumstances to pay the interest on the next business day payment and interest rates. 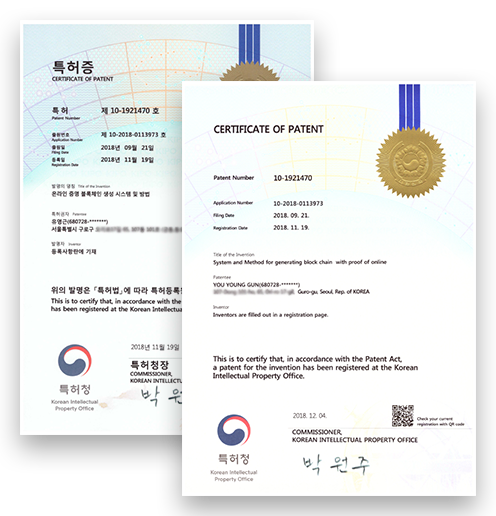 Based on issuing payment cards turnover in cryptocurrency, BM patent and immediate past experience in the design and development of the payment systems in the payment Q-platform, it is available immediately and been realized. Do you have another area to plan besides Q-platform? It will be added delivery or booking services that required high fees to merchants, and with continuous research and development to reflect the opinions of the site. How is Qcity and Qcoin related with each other? 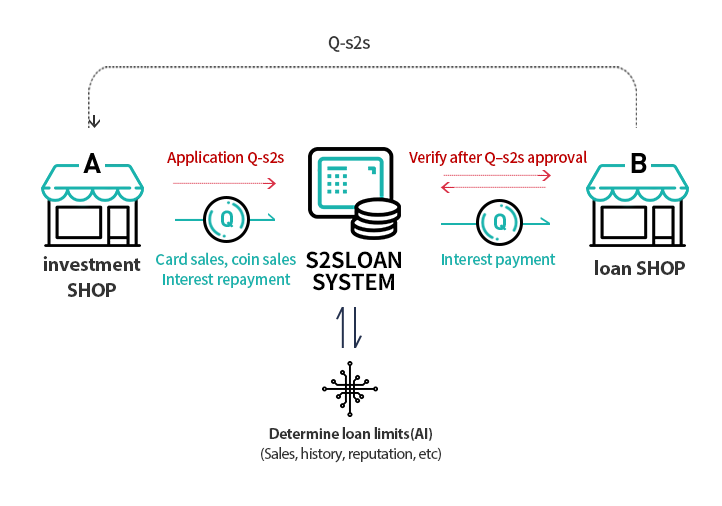 In Q-platform, merchants set aside Qcity to deduct funds in accordance with the voluntary contract, and will be used as collateral, such Qshop2shop and fees. 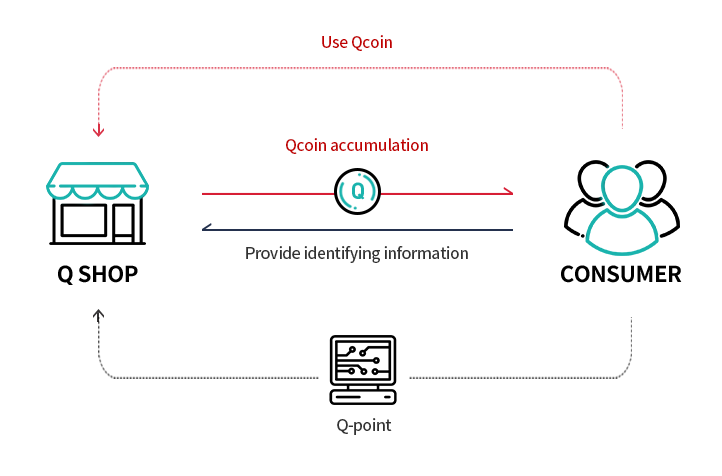 It is also required when an additional charge in the Qcoin of Q-platform. Qcoin are legal tender coin and 1:1 and will maintain the value of the deal means in the Q-platform. 큐시티의 개인정보취급방침은 다음과 같은 내용을 담고 있습니다. 큐시티는 상담을 위해 아래와 같은 개인정보를 수집하고 있습니다. 큐시티는 다음과 같은 방법으로 개인정보를 수집합니다. 큐시티는 수집한 개인정보를 다음의 목적을 위해 활용합니다. 큐시티는 이용자의 개인정보를 원칙적으로 외부에 제공하지 않습니다. 다만, 아래의 경우에는 예외로 합니다. 큐시티는 고객님의 동의없이 고객님의 개인정보 취급을 외부 업체에 위탁하지 않습니다. 큐시티는 원칙적으로 개인정보 수집 및 이용목적이 달성된 후에는 해당 정보를 지체 없이 파기합니다. - 회원님이 상담을 위해 입력하신 정보는 목적이 달성된 후 내부 방침 및기타 관련 법령에 의한 정보보호 사유에 따라(보유 및 이용기간 참조) 일정 기간저장된 후 파기되어집니다. 큐시티는 귀하의 정보를 수시로 저장하고 찾아내는 ‘쿠키(cookie)’개인정보를 자동으로 수집하는 장치를 설치.운용합니다. 병원은 다음과 같은 목적을 위해 쿠키 등을 사용합니다. 본 프로젝트의 대표이며, 지난 18년간 프로젝트 기획 및 관리와 Workflow시스템, 즉시결제시스템, 론시스템, 페이시스템, 포인트시스템 및 블록체인관련 시스템을 개발해 오고 있다.